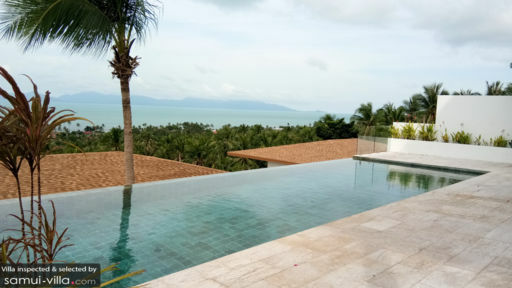 Perched atop a hillside in Samui, facing Bang Por Bay, Villa Lilly is a six-bedroom holiday haven which is part of a six-villa complex offering luxury amenities and five-star services to guests for a wonderful tropical getaway. 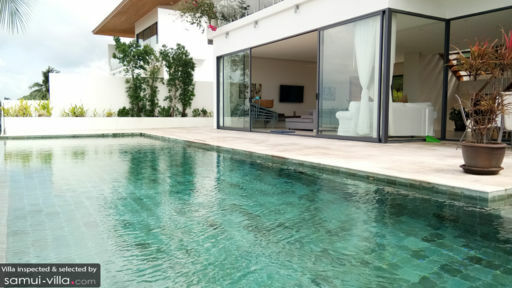 Clean and pristine interiors that have been designed to ensure maximum utilisation of stunning outdoor views, allow you to explore the island even while you’re lounging in your private infinity swimming pool. Head out to the beaches nearby or simply laze around in your private home for the most memorable experience with loved ones! At Villa Lilly, there are six bedrooms in total, three on each of its two floors and furnished with queen-sized beds and single beds. The upstairs bedrooms allow a mesmerizing view of the ocean that can be enjoyed right from the comfort of your own bed. Amenities are plenty in each bedroom for a comfortable stay. The bedrooms are simple with all-white interiors and a soothing ambiance. There are en-suite bathrooms with each bedroom fitted with proper amenities including showers and/or bathtubs! With splendid views that will surely take your breath away, enjoy the tropical breeze lightly fluttering across your skin as you lounge on the sunbeds placed on the pool deck. An infinity swimming pool gives you endless access to panoramic vistas of the bay area with dazzling ocean in constant, unobstructed views. An alfresco dining area is found right outside on the deck so you relish a delicious, local feast as you gaze at the beautiful scenery in front of you! As the lush greens invite you to appreciate nature, you are going to be mesmerized by the rustic nature of Samui’s many delights. A sprawling living space that opens out to infinite views of the ocean and luscious vegetation surrounding the villa is what you will get at Villa Lilly. Furnished with comfortable sofas and couches that offer a nice, cosy feel to guests who can then lounge about with ease, the living area is a perfect communal space for everyone! 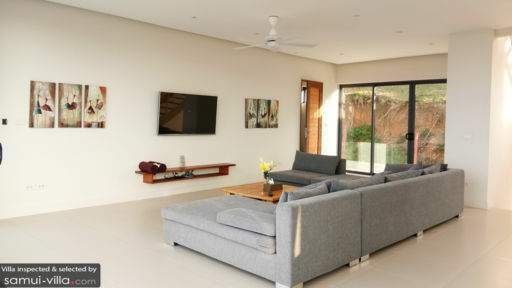 Sliding doors can be left open to allow the breeze to ventilate and air out the living room thus, making it all the more fresher and calming. There is a flat-screen TV mounted on the wall as well for your entertainment. The living area is not only seating but also a dining area and a kitchen space complete with a breakfast bar. There is space for all and you can enjoy a heart feast with everyone while enjoying the serene ambiance. Paintings don the walls to add a graceful touch to the bare and minimal space giving you more breathing area for a chill afternoon. The kitchen is equipped with more than just necessities so you have everything for a culinary trip. The breakfast bar serves as additional seating or a place to enjoy a quick bite before heading out to the pool. Guests of Villa Lilly have access to a horde of splendid activities including access to the gym, tennis court, and children’s play area. A free shuttle is there to take you in to the city centre or Bang Por shop area. A daily continental breakfast and the services of a chef can be arranged for guests complimentary to your stay. The villa offers a peaceful retreat to guests where they can languidly spend their time near the ocean at the beach. There are shops, bars, and restaurants in the area for you to explore, and if you wish you can even explore nearby islands or the beaches like Mae Nam!